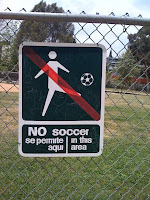 I'd noticed the bilingual no soccer signs in Silverlake's Bellevue Park before. 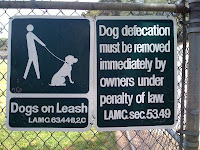 They are placed on the fences around the 2 almost-never-in-use baseball diamonds. These baseball fields are part of the effort to redesign Bellevue and kill off the pick-up soccer scene (e.g. large boulders and picnic tables strategically placed to break up open patches of grass). 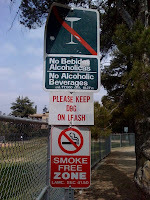 Today I was struck by the fact that only a few of the signs in the park are bilingual. 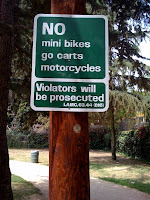 Most, in fact, are only in English. 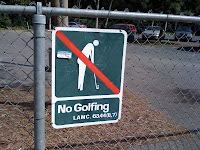 Apparently, if you are Anglo, you throw your trash around, prefer go carts, will play golf just about anywhere, and need to be reminded to pick up after your dog. 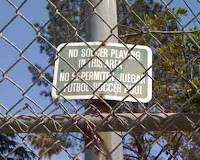 But the following instructions are given in Spanish: NO soccer se permite aquí & No Bebidas Alcoholicas. The former directive is illustrated by a stick figure kicking a soccer ball, the latter (incredibly) is illustrated by a champagne glass - there are even bubbles spilling over its left lip. I like to think someone has chalked in a balón at the base of the glass on the left, but I think it's just the remnants of a sticker. Apparently, si hablas español, you have the uncontrollable impulse to combine cocktail & ball. Before heading into the stadium I checked out the shop - no skort, or wrap, or whatever it is. The guys working there laughed when I asked if they carried it. 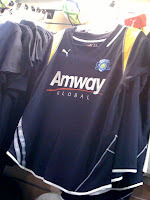 Looking at the pile of Marta shirts, I found myself contemplating not the name on the back, but the name on the front. Amway? I decided I'd rather wear a Brazil shirt. During the next few years the firm [Herbalife] was formally criticised at least three times by the United States Food and Drugs Administration, and subject to a CNN television exposé, a senate investigative committee inquiry, denunciations from a medical watchdog organisation and an $850,000 penalty payment imposed by the California attorney general for making false medical claims and marketing an illegal pyramid sales scheme. This recruited 750,000 "distributors" in what Hughes claimed were 48 countries, including Britain. I've always been puzzled by the Herbalife thing. It seems really backwards to have a weight loss/vitamin supplements company sponsoring a soccer team. Think in terms of fitness, for example - wouldn't the Galaxy want its message to be something like - get out there and play? Not: "take these magic pills and it will be as if you have played"? And then think in terms of marketing: do you really want to associate your team's identity with a company that's been stained with accusations of not only making false promises to its consumers about the health benefits of their product, but also of falsely representing how much money their distributors will make by signing on? Add onto this the cozy relationship between Amway, the Christian Right, and the Republican party (see, for example, Rolling Stone's 2005 article The Crusaders and this more recent article from Religion Dispatches, Worse than Madoff). You have to wonder why these teams are running around with different words for shady on their chests. Then remember that AEG is headed up by Philip Anschultz - who supports bigotry campaigns against gays and lesbians (read through "the movie, the media, and the conservative politics of Philip Anschultz" on mediatransparency.org). It's all just super creepy. The more I learn about the corporate architecture behind the Galaxy and now the SOL, the more depressed I become. All this aside - not that it can really be put aside - it was an entertaining game. It didn't start that way, though (See Nick Green's post, with great quotes from Aly Wagner about the rough start). Yesterday it was about 94 degrees in Carson - so neither the SOL not the Gold Pride looked quite right. In the opening minutes there was a general lack of fight for the ball - especially when asked to run it down. The game definitely picked up as the players adjusted to the heat. Looking over the WPS calendar I have to ask why on earth the Sol and their opponents are playing games at 1:00pm and 3:00pm in June, July, and August? The Galaxy play mostly early evening home games, with a few exceptions. A lot of the game's energy was generated by the two Japanese stars on the field: Aya Miyawa for the Sol, and Erico Arakawa. They both worked from start to finish, and were quick, great on the ball, and just all around dynamic - superstars, really. And I absolutely loved watching Formiga and Marta go up against each other. They seemed really well matched as Formiga won the ball off of Marta a couple times - I am a huge fan of hers, and can't wait to see her play again. The game was fun. Especially since I migrated from my $40 seats to the sparsely populated mid-field and found myself behind these gals. Check out the internationals - Miyama (a real star), and Abily - I saw Abily play for Montpellier and for Lyon!